With the recent upgrades being undertaken across many Sydney hospitals, SERS have been engaged by multiple clients to provide environmental monitoring within these sensitive areas to ensure that the normal day to day operations of the hospitals are not disrupted, or patients exposed to harmful elements. For our clients, SERS are providing daily and weekly reporting dependant on client requirements, which include recorded data compared against the National Environment Protection Measure (NEPM) guidelines for PM10 and PM2.5. Easy to view graphs are included for viewing and discussion with hospital staff. 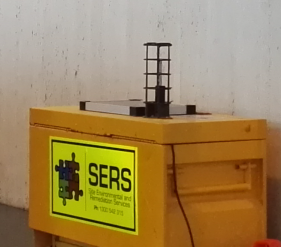 The SERS equipment in use is capable of simultaneously measuring both mass and size fraction of dust particles onsite. The monitors are battery or mains power operated with data-logging and light-scattering laser photometer that gives real-time aerosol mass readings. The equipment uses a sheath air system that isolates the aerosol in the optics chamber to keep the optics clean for improved reliability. Dust monitoring locations have been chosen for our clients so that a true representation of dust generation from the onsite construction activity is factored into the monitoring program at design stage.